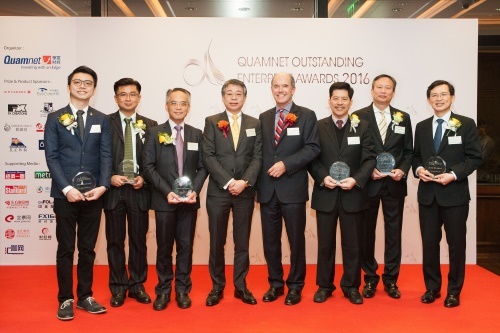 HONG KONG, Jan 19, 2017 - (ACN Newswire) - The award presentation ceremony of Quamnet Outstanding Enterprise Awards 2016 (QOEA), organized by Quamnet, successfully held on 12 January 2017 at The American Club Hong Kong. The representatives of the awarded enterprises and honorable guests convened, sharing the joy of achievements and exchanging ideas of successful experience. The ceremony drew media attention and was greatly supported by renowned members from the business community. 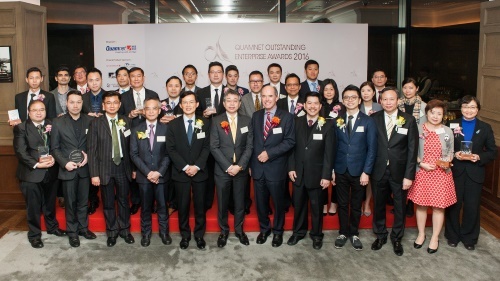 Since 2009, Quamnet has been organizing Quamnet Outstanding Enterprise Awards (QOEA), which has committed to recognize outstanding enterprises for their success with rigorous assessment. Embracing its eighth year, QOEA with theme of "Leading with wisdom", which means all winning companies took the lead to define Hong Kong and boost up Hong Kong economy. A total of 20 awards were presented in recognition of the achievements of 20 enterprises covering different sectors and industries. 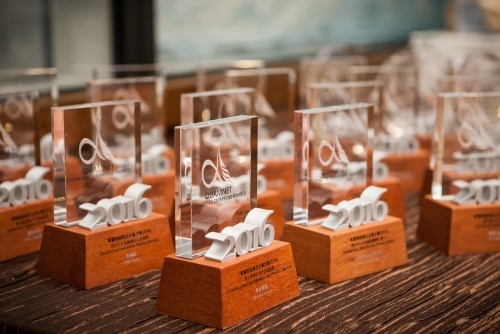 Among the winners, 12 enterprises awarded last year won the awards again, including Air Canada, The Bank of East Asia, Limited, Censere Group, China CITIC Bank International Limited, China Construction Bank (Asia), Chow Tai Fook Jewellery Group Limited, Invesco Hong Kong Limited, Kerry Logistics, Macquarie Capital Limited, New World Development Company Limited, Transamerica Life (Bermuda) Ltd. and Yuexiu REIT Asset Management Limited. Meanwhile, 8 enterprises were awarded for the first time, including Agile Group Holdings Limited, CITIC Telecom International CPC Limited, CME Group, Hang Sang (Siu Po) International Holding Company Limited, HNA Holding Group, Imperium Financial Group, K. Wah International Holdings Limited and Yuexiu Transport Infrastructure Limited. At the ceremony, Dr. Kenneth Lam, CEO and Deputy Chairman of Quam Financial Service Group, said, "They (the awarded enterprises) have all demonstrated strong leadership, outstanding entrepreneurship, incredible insight and high levels of commitment, to delivering sustainable growth which enable them to succeed in this rigorous business environment." Meanwhile, Mr. Richard Winter, Deputy Chairman of Quam Financial Services Group appreciated the support from award presenters, added, "In this year's winner's list, I see some old friends and also some new faces, together representing a wide spectrum in our economy, and making the Awards truly representative of our market." Quamnet was honored to invite Dr. Cho Kwai Chee, Roy, Permanent Honorary President of Hong Kong Commerce, Industry & Professionals Association; Mr. Choy Sze Chung, Jojo, Permanent Honorable President and Vice Chairman of the Institute of Securities Dealers Ltd.; Prof. Jeffrey Phoenix Hui, Chairperson of Hong Kong Institute of Marketing; Mr. Kwong Dak Shing, Chairman of Hong Kong Precious Metals Traders Association Ltd; Prof. Raymond W.M. So, BBS, JP, Dean of School of Continuing Education, Hong Kong Baptist University; Mr. Michael M.S. Wong, President of Society of Registered Financial Planners, as our guests of honor to witness the glorification of the outstanding enterprises. Dr. Cho Kwai Chee said he was pleased to attend the award presentation ceremony. He added, "The successful winning enterprises not only show the importance of wisdom and leadership, but they share their outstanding performance, as well as their perseverance in striving for prominence." Mr. Choy Sze Chung, Jojo was excited to see some old friends and some new faces, together representing a wide cross-section of our economy. Prof. Jeffrey Phoenix Hui noted that in the digital and social media era, continuous innovation and development are of paramount significance. He was pleased to see the winners, ranging from large companies to SMEs from different sectors, highlight the diversity of Hong Kong's economy, creativity and successful marketing strategies. The vibrant nature of this beautiful city makes it an ideal location of investment and development. Mr. Kwong Dak Shing, Chairman of Hong Kong Precious Metals Traders Association Ltd., stated, "Despite the global uncertainties, the awardees have shown great wisdom in striving for growth and leading the industry to a new era, which echoes with the theme of QOEA this year." Prof. Raymond W.M. So, BBS, JP, said "All the winners strive for excellence and contribute to society by various means to meet the commercial success and community care. Your care for the society has made Hong Kong a more livable city and a better metropolis for business." Mr. Michael M.S. Wong, President of Society of Registered Financial Planners added "the Awards create an environment for benign competition, which in a broader sense, also helps enhance the competitiveness of Hong Kong in a collateral but influential way." To maintain competitive edges, enterprises striving for excellence roll out innovative strategies in response to the rapid market changes. 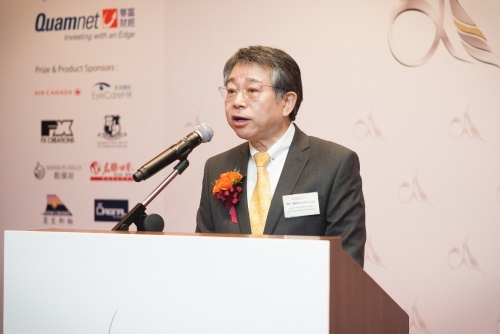 Mr. Alex Wong, General Manager of Hong Kong and Macau Management Centre, Chow Tai Fook Jewellery Group Limited, said, "We are most grateful to Quamnet for awarding Chow Tai Fook the "Outstanding Jewellery Retail Network" for consecutive five years, in recognition of our leading position in the industry. We will continue to enhance our product offerings, upgrade our store image and uplift customer experience, as well as developing multi-channel retailing to extract more online-to-offline synergies for achieving sustainable business development." Nowadays, banks are pulling out all stops to launch mobile banking services as a means to increasing their competitiveness in the market. Anne Lee, Executive General Manager, Customer Strategy and e-Business, China CITIC Bank International, notes that the Bank enhances its mobile banking customer experience and offerings continuously with a view to better serving customers' needs. The Bank was the first in Hong Kong to introduce fingerprint recognition technology into its mobile app CITICmobile, which allows users to check their account balances in a one-handed operation without the need to type in a password. As regards future development, Ms Lee adds, the Bank will continue to examine the integration of banking services into social media, for instance, by referencing its parent bank China CITIC Bank's experience, and riding on the FinTech trend to launch more innovative, convenient and personalised mobile banking services. Information and Communications Technology (ICT) market has grown with leaps and bounds; while high quality network connectivity, information security, cloud computing, and cloud data center solutions are vital to improve enterprises effectiveness and efficiency. Mr. Daniel Kwong, Senior Vice President, Information Technology and Security Services of CITIC Telecom International CPC Limited said the company was dedicated to capitalize on the vast potential of Software-defined Networks (SDN) and Network Functions Virtualization (NFV) market in 2017 with a visionary roadmap, including enhancing its product portfolio with innovative new NFV-capable solutions, comprising virtualized UTM and networking devices (e.g., routers). In the future, the company will devote to exploiting new technologies on ICT, such as Big Data Analytics, Internet of Things (IoT), and Software-defined Everything (SDX). Together with its network, security, cloud computing, and cloud data center capabilities, the company strives to provide its customers with innovative solutions, helping them to further develop their businesses. Mr. Alexander Fung, Executive Director of Hang Sang (Siu Po) International Holding Company Limited said the company has reached the milestone in 2016, as it had been successfully listed on the Main Board of the Hong Kong Stock Exchange with and became the third over-subscription new shares in the Hong Kong's history and strengthen the company's capital base after the successful listing and lead the company into a new stage. Facing the rigorous competition in the markets, Mr. Fung suggested the company has advantages, including a stable professional and technical team, over the years with customers to establish good relations and goodwill, the company still has room for development. The main direction of future development is increase the production capacity, research and develop the know-how of the application of heat transfer technology and strengthening the sales and marketing team with the newly acquired printing machine will offer the advanced and professional technology to provide high-quality products, as a way to increase productivity and capacity in order to satisfying the needs of customers. Looking ahead, the company will consider participating overseas apparel labels and packaging printing products industry expo for more international exposure by the base in Hong Kong. With its professionalism in precious metal trading and accompany with multiple investing products, Imperium Financial Group has always paid its effort in developing various businesses conducted by its affiliated companies. Mr. Leo Chiu, Chief Executive Officer of Imperium Financial Group, sees internationalization as the strategic plan in the future. Imperium Financial Group will provide entirely new services and have closer ties with top-notch financial professionals or companies from overseas, and tends to open a new chapter in its international markets. Looking forward to 2017, Imperium Bullion Company Limited, one of the associated companies, is planning to upgrade the network marketing that draws them closer to customers. Imperium Forex Group PTY Limited devotes to increasing the varieties of products by expanding the investment services domestically and internationally. Imperium Ever Fountain Global Wealth Management Limited progressively offers better plans as sales incentive compensation approaches to improve competitiveness in domestic and international markets. With a strong foothold established in Hong Kong, K. Wah International Holdings Limited ("KWIH") has grown and prospered into a leading integrated developer and investor of exquisite and niche projects, with a strategic focus on Hong Kong, the Yangtze River Delta and Pearl River Delta regions. The company succeeded in replenishing its land bank at the end of 2016 by winning a residential plot in the Kai Tak Development Area, Hong Kong and a prime land parcel in Nanjing, China. The two sites are set to enjoy huge development potential, thus providing solid and strong business momentum in the future, KWIH said. On corporate governance, KWIH believes that sound corporate governance is essential to high-standard business operations. Hence, the company places a strong emphasis on strong team spirit that every of its employees complements each other to work hard on maintaining solid corporate governance practices in order to pass on KWIH's most-valued spirit of excellence and sustainability. As the first listed real estate investment trust only investing in properties in mainland China in the world, Yuexiu REIT Asset Management Limited focuses on office, retail and other commercial purposes, strives for properties, which can bring considerable returns and pursuing business opportunities for achieving higher revenue growth. Mr. Patrick Cheng, Deputy General Manager of Investment, Yuexiu REIT Asset Management Limited said Manager of Yuexiu REIT is looking for valuable investment projects, and continuously in search of premium property in first-tier cities (including Beijing, Shanghai, Guangzhou, Shenzhen) and second-tier cities (including Wuhan, Hangzhou) in China. The company optimizes every opportunity of the unitholders and continues to enhance asset appreciation capability and capital operation capability. In addition to a strong lineup of guests, the award presentation ceremony attracted numerous media and sponsors both in Hong Kong and China. Our supporting media partners include Economic Digest, Metro Daily, The Standard, Tencent finance, Eastmoney, CNFOL, P5W, FX168 and so on. Besides, several companies supported QOEA by offering products & prize sponsorship, including BEAUTE Group, FX Creations, Hamilton Hill International Kindergarten, EyeCareHK, Mission Hills Golf, Sanotact (HK) Limited (Impact Original mints), Resorts World Sentosa, Star Cruises and Air Canada. 18. Outstanding Life Insurance Company 2016 / Transamerica Life (Bermuda) Ltd.
Group photo of Quam Management, Guests of Honour and Sponsors. Welcome message from Dr. Kenneth Lam, CEO and Deputy Chairman of Quam Financial Services Group. 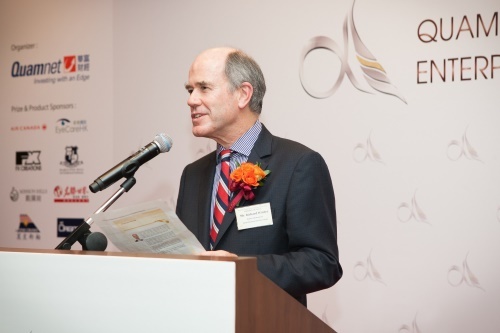 Thank you message from Mr. Richard Winter, Deputy Chairman of Quam Financial Services Group. "Quamnet Outstanding Enterprise Awards 2016" trophies.